While it’s true that we look forward to seeing our favourite celebs go down the red carpet no matter what they’re wearing, we have to admit that the thrill of watching any award show is always elevated by unforgettable fashion. This definitely rang true at the recent Golden Globes, and thankfully, we can say that tonight’s Screen Actors Guild Awards were no exception. With a slew of starlets whose looks were as on point as the performances for which they were being recognised, we had trouble keeping tabs on our ever-changing list of favourites—and you’re about to see why. Scroll through for the night’s most standout looks and for all the details on each! 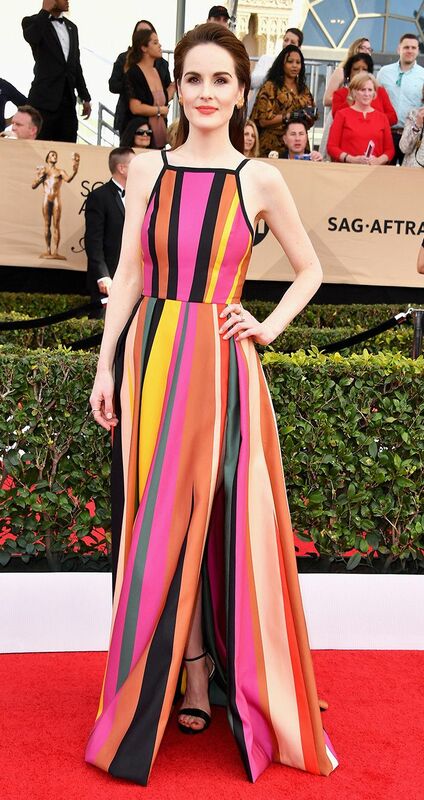 WEAR: Elie Saab S/S 17 multicolor high-neck striped gown. WEAR: Custom Giorgio Armani gown. WEAR: Naeem Khan gown; Jane Taylor jewelry. WEAR: Tadashi Shoji gown; Jacob & Co earrings and ring. WEAR: Marchesa dress; Jacob & Co earrings. WEAR: Roberto Cavalli gown; Lorraine Schwartz jewelry; Lee Savage clutch; Christian Louboutin shoes. WEAR: Vivenne Westwood gown; Nirav Modi necklace. WEAR: Dress the Population Harper Mermaid Gown ($308); Irene Neuwirth jewelry. WEAR: Lorraine Schwartz jewelry; Zuhair Murad dress. WEAR: Vivienne Westwood gown; Irene Neuwirth jewelry. WEAR: Dior gown; Tiffany & Co. jewelry. WEAR: Altuzarra suit; Tiffany & Co. jewelry; Salvatore Ferragamo shoes. WEAR: Gucci gown; Irene Neuwirth jewelry.